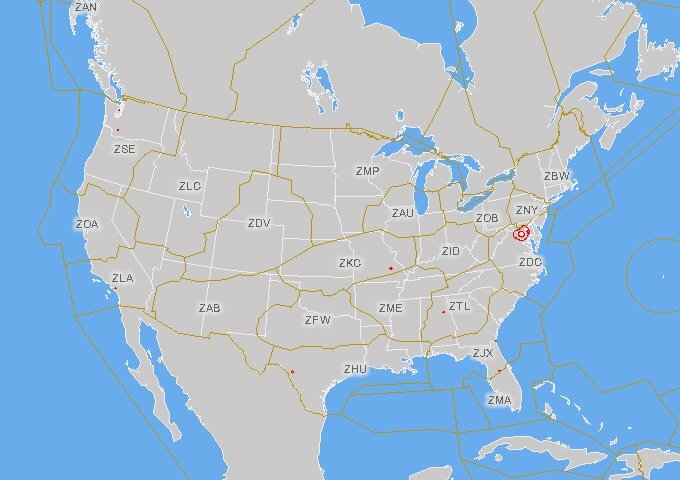 This temporary flight restriction map from the Federal Aviation Administration shows the boundaries of the regions controlled by the Area Control Centers within and adjoining the continental United States, as well as the FAA location identifier of each such Center operated by the United States. In air traffic control, an Area Control Center (ACC), also known as a Center, is a facility responsible for controlling instrument flight rules aircraft en route in a particular volume of airspace (a Flight Information Region) at high altitudes between airport approaches and departures. In the United States, such a Center is referred to as an Air Route Traffic Control Center (ARTCC). A Center typically accepts traffic from, and ultimately passes traffic to, the control of a Terminal Control Center or of another Center. Most Centers are operated by the national governments of the countries in which they are located. The general operations of Centers world-wide, and the boundaries of the airspace each Center controls, are governed by the ICAO. In some cases, the function of an Area Control Center and a Terminal Control Center are combined in a single facility. For example, NATS combines the London Terminal Control Centre (LTCC) and London Area Control Centre (LACC) in Swanwick in the UK. [a] facility established to provide air traffic control service to aircraft operating on IFR flight plans within controlled airspace, principally during the en route phase of flight. When equipment capabilities and controller workload permit, certain advisory/assistance services may be provided to VFR aircraft. An ARTCC is the U.S. equivalent of an Area Control Center (ACC). The Flight Information Region controlled by a Center may be further administratively subdivided into Areas comprising two to seven sectors. Each Area is staffed by a set of controllers trained on all the sectors in that area. Sectors use a distinct radio frequencies for communication with aircraft. Each sector also has secure landline communications with adjacent sectors, approach controls, areas, ARTCCs, flight service centers, and military aviation control facilities. These landline communications are shared among all sectors who need them and are available on a first-come, first-serve basis. Aircraft passing from one sector to another shall be handed off and requested to change frequencies to contact the next sector controller. Sector boundaries are specified by an aeronautical chart. 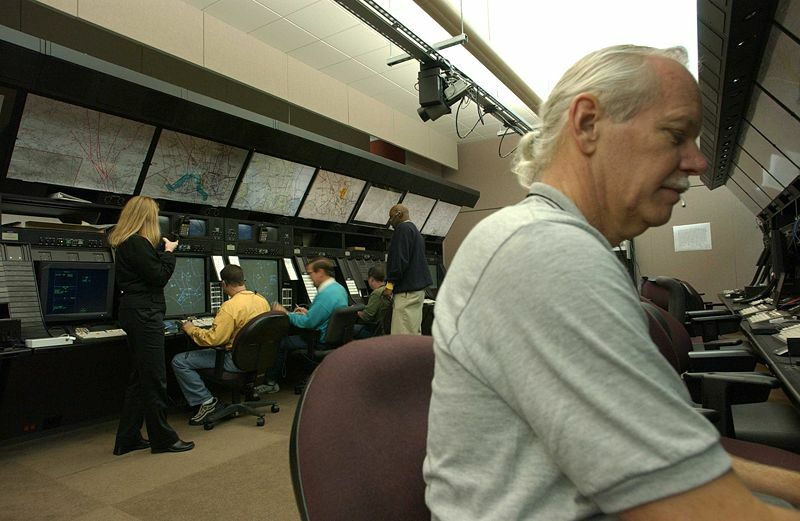 Controllers at work at the Washington Air Route Traffic Control Center. Air traffic controllers working within a Center communicate via radio with pilots of instrument flight rules aircraft passing through the Center's airspace. A Center's communication frequencies (typically in the very high frequency frequency modulation aviation bands, 118 MHz to 137 MHz, for overland control) are published in aeronautical charts and manuals, and will also be announced to a pilot by the previous controller during a hand-off. In addition to radios to communicate with aircraft, Center controllers have access to communication links with other Centers and TRACONs. In the United States, Centers are electronically linked through the National Airspace System, which allows nationwide coordination of traffic flow to manage congestion. Centers in the United States also have electronic access to nationwide radar data. Controllers use radar to monitor the progress of flights and instruct aircraft to perform course adjustments as needed to maintain separation from other aircraft. Aircraft with Center contact can be readily distinguished by their transponders. Pilots may request altitude adjustments or course changes for reasons including avoidance of turbulence or adverse weather conditions. Controllers can assign routing relative to location fixes derived from latitude and longitude, or from radionavigation beacons such as VORs. See also Airway; VORs, Airways and the Enroute Structure. Typically, Centers have advanced notice of a plane's arrival and intentions from its prefiled flight plan. Some Centers have ICAO-designated responsibility for airspace located over an ocean such as ZOA, the majority of which is international airspace. Because substantial volumes of oceanic airspace lie beyond the range of ground-based radars, oceanic airspace controllers have to estimate the position of an airplane from pilot reports and computer models (procedural control), rather than observing the position directly (radar control, also known as positive control). Pilots flying over an ocean can determine their own positions accurately using the Global Positioning System and can supply periodic updates to a Center. See also Air traffic control: Radar Coverage. A Center's control service for an oceanic FIR may be operationally distinct from its service for a domestic overland FIR over land, employing different communications frequencies, controllers, and a different ICAO code. Pilots typically use high frequency radio instead of very high frequency radio to communicate with a Center when flying over the ocean, because of HF's relatively greater propagation over long distances.